A.J. Bowen plays a Vice reporter who finds himself covering a thinly veiled version of the Peoples Temple. This week in movies you missed: It's October again, season of crappy horror releases, so I'm on the hunt for a scare flick that will actually scare me. Where better to look than among movies I missed? Let's start with The Sacrament, the latest from director Ti West (The House of the Devil, The Innkeepers). This found-footage film has a simple premise: What if Jonestown had happened last year, and Vice Media was there to film it? Vice reporter Sam (A.J. Bowen) explains self-importantly to the camera that he practices a new form of gonzo journalism called "immersionism." Next up: He'll immerse himself in a utopian community that could well be a cult. Sam's photographer friend Patrick (Kentucker Audley) has arranged to visit his ex-addict sister at Eden Parish, an overseas colony built by a religious community with a charismatic leader called "Father." Patrick, Sam and Vice photographer Jake (prolific indie director Joe Swanberg) take a helicopter into the jungle, where they're met by guards with machine guns. The Sacrament played five U.S. theaters this past summer and is now available on Blu-ray, Netflix Instant and Amazon Instant. During how many scenes was I genuinely scared? Two, and they were not the scenes involving the little girl named Savannah, who seems to be a misplaced homage to The Ring (see clip above). Was I shocked/grossed out? In a good or a bad way? Then again, many real children died at Jonestown — far more than shown here. (Eden Parish has a budget-friendly 167 inhabitants; Jonestown had 909 victims.) Pretty much everything shown in The Sacrament — parents handing cups of poison to their children, babies being injected with cyanide — happened in real life. West stages his horrifying re-creation effectively, but that doesn't answer the question: Did it need to be done? Did the director do anything new with the formula? West throws a few twists into the standard (and increasingly tired) found-footage M.O. The real Jim Jones was obsessed with his media image and made an audiotape of the meeting that resulted in the mass murder/suicide. So it makes perfect sense that Father (a fairly creepy Gene Jones) would appropriate the Vice crew's video equipment and use it to his own ends. 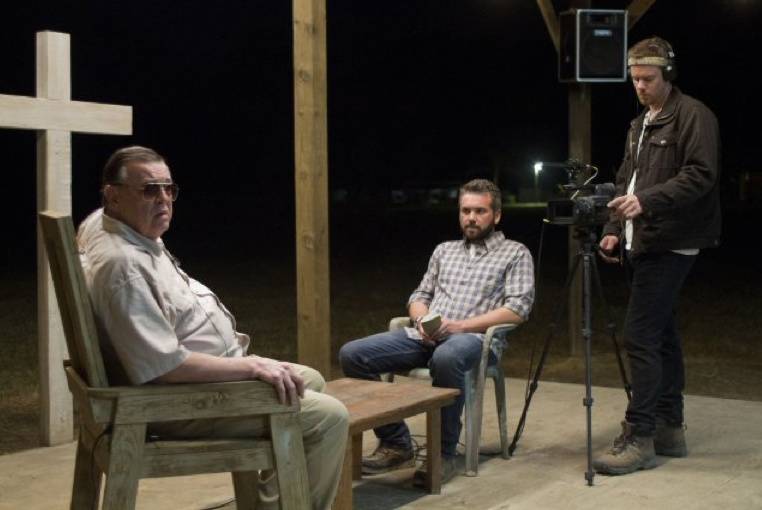 The Sacrament is most interesting when it raises questions about the ethics of "immersion" journalism and the reporters' degree of complicity in events they can't prevent. What I like about West's past work is his willingness to create tension by drawing out a shot or scene to unconscionable lengths, waiting until the viewer's boredom curdles into discomfort and dread. (Mileage will vary, but I thought the wandering-around-the-house scenes in The House of the Devil were terrifying. The scenes where something actually happens, less so.) In The Sacrament, there's a long stationary shot that both tricked me — by going against found-footage expectation — and freaked me the hell out. This is what brainwashed looks like. Were the characters so stupid I wanted to see them die? No, but they are basically just stock figures. Seimetz has been great elsewhere, but she can't do that much with the role of an unquestioning groupie. Was there any point to it all? That raises the question: Is The Sacrament any more creative and less exploitive than a tabloid TV reenactment? Or than this, also a lightly fictionalized film version? While the movie's framing does offer a new lens through which to view the tragedy, I didn't find that the Vice reporters' perspective ultimately added much insight. So, while The Sacrament appealed to me as a horror fan fascinated by both journalistic dilemmas and cults, it left a bad taste in my mouth. Verdict: A couple scares, a couple cringes. Roxy only: Jeremy Renner plays a crusading journalist in Kill the Messenger. Roxy and Savoy: Mia Wasikowska does her own version of Wild in Tracks. Savoy only: An amateur opera singer has One Chance to find fame on a reality show. Everywhere else: A kid named Alexander has a Terrible, Horrible, No Good, Very Bad Day. Robert Downey Jr. plays one of those type-A urban professionals who has to go back to his hometown and Learn Lessons in The Judge. Dracula Untold is the origin story I know I wasn't asking for. The Grand Seduction, Million Dollar Arm, A Million Ways to Die in the West, Obvious Child. Alexander and the Terrible, Horrible, No Good, Very Bad Day, Dracula Untold, Kill the Messenger, One Chance, The Judge, The Sacrament, and Tracks are not showing in any theaters in the area.